People of The United Brethren faith have dwelt and worshiped in Guernsey County for more than 180 years. Perhaps the first of the faith settled in the Salesville community. In August 1828, the United Brethren held a camp meeting in a grove near Salesville. The Rev. John Crum, the presiding elder, addressed a large crowd on a Sunday afternoon. The second United Brethren Church in Guernsey County was established in Washington Township in 1838 when a minister of western Pennsylvania stopped to hold religious services at homes on the old Londonderry and Coshocton trail. A young minister, the Rev. John Weaver (later bishop) dedicated a crude log structure, the Chestnut Hill United Brethren Church that was replaced by a frame building in 1863. In June 1891, at a meeting in Salesville, the matter of establishing a United Brethren Church in Cambridge was considered. The Rev. Wise, the presiding officer, stated he would consider the matter but before plans were completed he passed away. In August 1891, the Rev. Isaiah Dennis organized the Madison Avenue United Brethren Church in Cambridge. From this small beginning there was a gradual increase in the membership until the church outgrew its original quarters. The Sunday school, the Ladies Aid Society, the Christian Endeavor and other organized bodies of the church flourished and kept pace with the growing membership. The original building was remodeled and repaired from time to time and new departments were added to the church. In March 1926, during the ministry of the Rev. Mitchell, three fine lots, 120-by-107 feet, at the corner of South Seventh Street and Jefferson Avenue were purchased for the amount of $1,200. Under the guidance of Mitchell plans were laid for the building of a new and modern church. A building fund was started and the building committee was named as listed in the minutes of the board of trustees on July 1, 1927. On Oct. 29, 1929, the new church was dedicated. In 1946, there was a merger of the Evangelical and United Brethren churches and the denomination became the Evangelical United Brethren. On July 27, 1960, the congregation voted to build a new parsonage on the three lots at 605 Jefferson Ave., which had been purchased some years earlier for that purpose. On May 7, 1961, the new parsonage was dedicated. In 1968, the union of the Methodist and Evangelical United Brethren denominations brought into being the United Methodist Church. 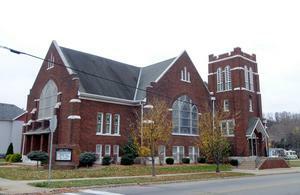 By congregational vote the name of Faith United Methodist was chosen for our church. Rebecca Evans was the last funeral in the old church and her grandson, Edward Pitt, was the first funeral in the new church. Rebecca was the mother of Frances Evans Pitt; grandmother of Margaret Pitt McMillen; great grandmother of Frances McMillen Haynes, David McMillen, Harry McMillen and Rose Mary McMillen Long; great-great grandmother of Peggy Haynes Touvell, Kim McMillen, Becky McMillen Masters, Terri McMillen McFarland and David McMillen. The first wedding ceremony in the new church was the marriage of Pauline Nowell and Alfred Lyttle, performed by the Rev. E. E. Rush, Sept 29, 1929. Pauline is the aunt of Betty Nowell Rice. This happened before there were pews in the church and the radiator had not yet been installed. Everyone stood on wooden planks for the ceremony.